Google the problem and looks like a well know issue but again new to me! After new tires I noticed the lug nuts were mangled. The torque was extreme and needed a long bar and had to stand and jump on the bar to get them loose. While doing so I also destroyed the 19mm aluminum housing and had to use an 18 mm socket to get the underlying nut off. I bought new acorn nuts but only got 9 old nuts off. Discount Tires says to come in tomorrow and will finish the job. Question: What is the best torque for the new solid nuts? A fellow Jeepers says over torquing can warp the brake rotors! True??? A Caution: In two days will be crossing the The Mohave Road from the Colorado River to Barstow, about 1/2 way to LA. If I had a flat out in the desert I don't know if I could get the lug nuts off. Even though I usually run with a group this looks to be a safety issue. So I'd suggest if you have the stock Chrysler lug nuts I'd change them out to solid ones. The one on the right is from Amazon, $25 for a set. There are more expensive ones but I live out west and we don't have a rust problem so trying these out. My mustang, 97 heep and my 04 heep have all experienced separation like this with the lug nuts. It's annoying but I've never experienced problems with the lugs backing out because the cover came off. I just replace them as it happens. As far as torque, until I had a torque wrench i'd tighten them until the tire spun and then drop the jeep to the ground, set the parking break and then tighten them until the vehicle rolled back. I never had issues with them coming loose doing it that was and it gave me insurance that I'd be able to break them loose as long as the tires were on the ground. No i hand thread the lugs and then use my impact to spin them the rest of the way on. Once the jeep in on the ground I'll tighten them to 90-100ft-lbs which is about the same I've found they were set before I had the torque wrench. I dunno if there are specs for the lugs in the FSM but that's because I've never looked haha. mac, johncanfield and sierrabob like this. You won't warp the Jeep rotors as the studs are not part of the rotors. On some older vehicles the studs were part of the rotors. Torque them to the factory specs. Around 100 ft lbs I think. The actual size of the factory lug nut is 3/4 inch but 19 mm will work. mac, Mouse, johncanfield and 1 others like this. I had that problem in many vehicles, in my experience is caused by tire shops using the impact wrench and the wrong socket and/or over-torquing, there is a flip socket most of them use. if the installer uses the wrong side it will mangle the tin cover just like your pictures show. As you discovered the solution is to use solid lug nuts. Torque spec is 85 to 125 ft-lbs. I set my vehicles at 90 ft-lbs, that puts me in the range of most manufacturers specifications. mac, Mouse, johncanfield and 2 others like this. The independent tire shop I use always follows up the impact gun with a torque wrench. Like the other guys, I torque mine to about 100 ft. lbs. mac, Mouse, Desert Dog and 1 others like this. Grrrrr! Those tire shops and their impact guns have piss me off one too many times. Whenever possible I put my vehicles on jack stands, take my wheels off, take the wheels to the shop for tire mounting/balancing etc, then bring them home and install them myself. My '04 gets pampered with 100 ft/lbs torque and anti-seize on the lug studs. mac, johncanfield, sierrabob and 1 others like this. Shouldn't be a safety issue since its just the cosmetic caps... but yes the tire monkeys are hard on the nuts. I keep a box of stock nuts in the glove box. I can count on a few damaged nuts if I take it in for tire service. The solid nuts are chrome plated and when the same techniques and tools are used it tends to remove the plating and rust happens ... the stock covers are stainless steel so pick your poison I guess. mac and johncanfield like this. If the gun is set right or they are using a torque stick it works, but if the impact gun already has the lug nuts at 130 ft lbs and the torque wrench is set at 100, it clicks, but does nothing to prevent over torquing. Next time you go see if they are actually tightening the nut a bit with the torque wrench of if it just clicks when they put it on. I agree with all but for a little insight. Has anyone ever worked at a tire shop? It is a terrible job. Most of the chain stores have a steady turnover of either young guys or transient adults who have a hard time staying employed. They get yelled at to work faster while going deaf and breaking their back. If you can find a repair shop that handles tires then get a relationship and buy through them. It will cost a little more but you will get a premium service. mac, DAA, johncanfield and 1 others like this. 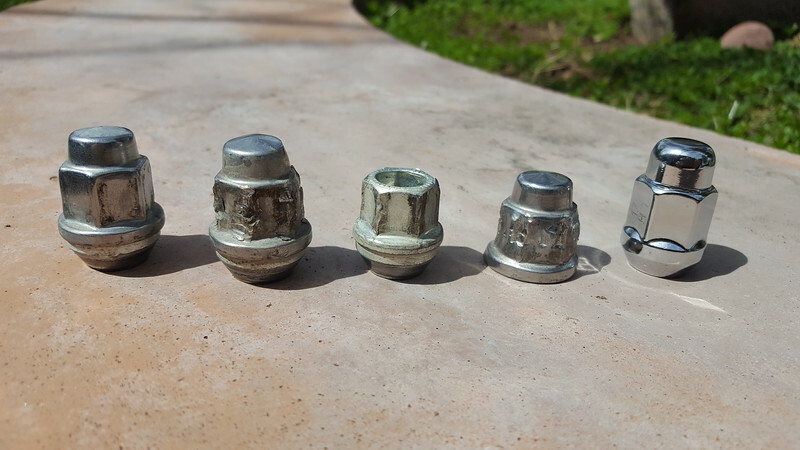 You can get stainless steel or zinc plated nuts to prevent rust. Given the choice between a lug nut with some surface rust or one with a stripped sleeve which does not fir the car's lug nut wrench I'll take the rust. Many years ago I made it a habit to toss a4-way lug nut wrench in all my vehicles, precisely because I couldn't remove a sleeveless nut. mac and sierrabob like this.